Comments: Scripted by the team of Scott Benson and Len Kaminski. Mandarin's Avatars (Q'Wake, Deluge, Butterfly, Foundry, Lich) are seen only in shadows, their official first appearance will be in FORCE WORKS #6.
Review: Iron versus iron action. The latest confrontation between the two armored ex-friends is mostly set up here with that opening recap of bad blood and the bulk of the battle is postponed until the next issue. Gecko's and Eklund's art suits the action well; the Mandarin pages are especially effective. Story continues from IRON MAN #309. 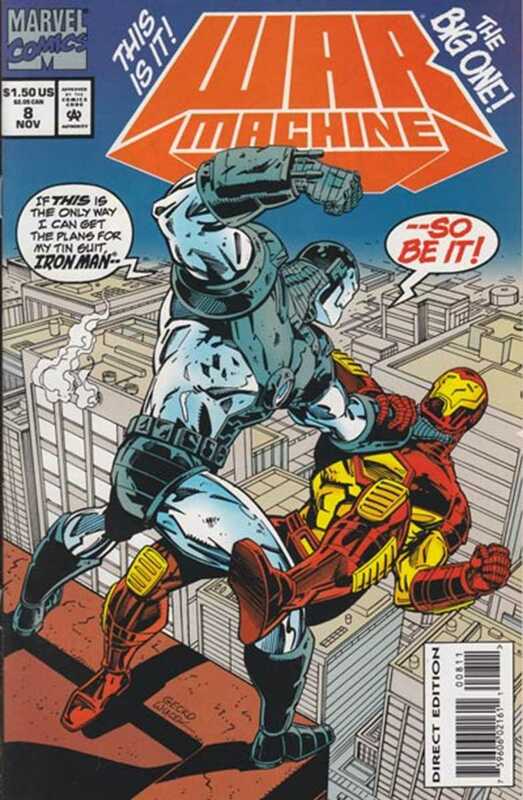 War Machine arrives at Stark Enterprises and is met on the roof by Bethany Cabe who warns him not to start trouble. He heads to the main office where Tony meets him in his Iron Man armor. Rhodey demands the specs for the suit; Tony demands he surrender it, citing his latest “misuse.” Rhodey jets off angrily and Tony follows. They battle in the sky, unaware that the Mandarin is watching via the Heart of Darkness, plotting his revenge against them both and gloating about it to his unseen minions. The battle moves to the ground and Tony distracts Rhodey with talk while he secretly interfaces with Rhodey's armor, shutting it down. War Machine stiffens then topples to the ground. Is this the end? Story continues in IRON MAN #310. Plus: Avatars, Bethany Cabe, Felix Alvarez, Mrs. Arbogast, Paula Lin, Ranald Jeffries, Rebecca Bergier, Sheva Joseph, War Machine (James Rhodes).